This is the hardest one, and the most important, for my money. Many adults would recognise that it’s easier to be the CEO of a do-gooding international charity than to be consistently kind and loving to your spouse, that socially awkward relative or a difficult staff member. Wouldn’t the world be better if we all made ‘we are kind to people’ a stated value, a mantra, in our homes? Let’s treat unkind behaviour just as seriously as running onto a road, worthy of an important conversation and opportunities for learning and restoration. Let’s model kindness to our kids and help them grow in kindness each day. We do not care if you are the smartest or fastest or coolest or funniest. There will be lots of contests at school, and we don’t care if you win a single one of them. We don’t care if you get straight As. We don’t care if the girls think you’re cute or whether you’re picked first or last for kickball at recess. We don’t care if you are your teacher’s favorite or not. We don’t care if you have the best clothes or most Pokemon cards or coolest gadgets. We just don’t care. Can you imagine the enormous difference your little daughter or son could make to the life of the loneliest kid in their class? That’s parenting gold, right there. It was interesting to hear her talk today of her own mum. “She didn’t push us to achieve at school academically, or excel in other areas – she just wanted us to be good.” That was quite a revelation. It is true of mum herself and it is true of what she has tried to pass on. Every day we’d go off to school with the following words ringing in our ears: “be good, be kind, be true – and look after the lonely ones”. 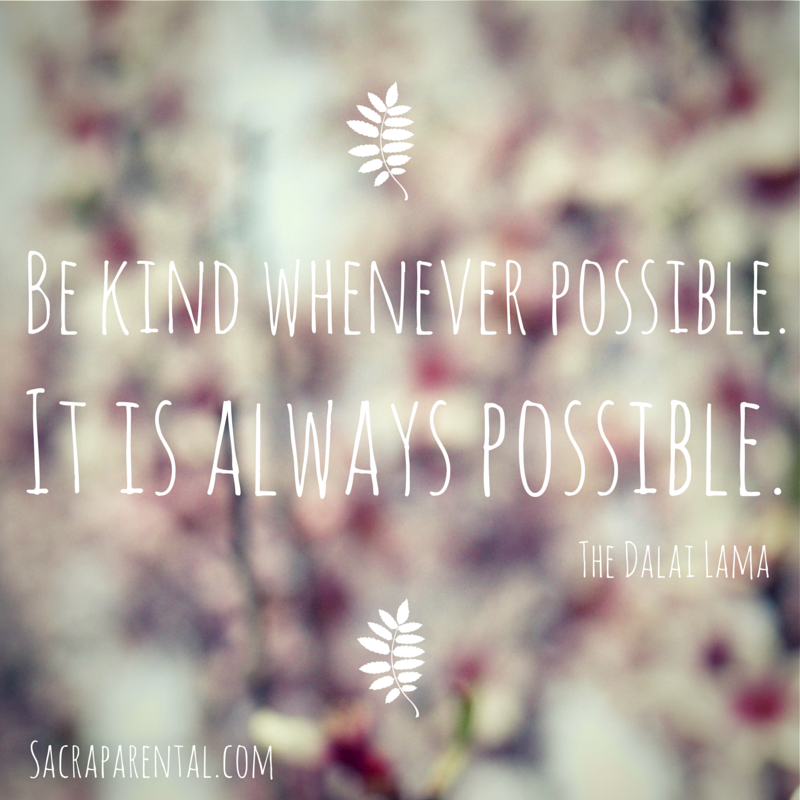 What other ideas do you have about helping kids to be deeply kind? I’d love to hear your thoughts in the comments below. Recent research showed that parents at home were asked more questions per hour than the Prime Minister during parliamentary question time – I’m sure this is not a surprise to you. But what a great opportunity – what a great window of time – to help children understand the true cost of consumer goods and modern living, and engage them in social justice living. Please don’t stand on the drawer. Because it might break, and someone spent a lot of time making it. Because it takes a long time to make something good. And then someone else would have to take a long time to fix it. So it’s best to just look after our things. So please don’t stand on the drawer. Oh. I’m just touching it now. I predict you will have many opportunities to have versions of this conversation! Kids often love learning about supply chains. Give some thought to how the things they consume or use daily were produced and tell the stories to your kids – or let them research that stuff themselves. Older ones might enjoy this brilliant video, The Story of Stuff, an animated talk on the consumption chain – with heaps of resources and follow-up videos at their website. Whether or not your kids have pocket money, they certainly have financial influence. Enlist their help in putting together your grocery list and talk together about where things come from. Why do you, in your house, choose organic, or fairtrade, or local, or eco-friendly products? Let them help you pick out their friends’ birthday presents from Trade Aid or a charity shop (you could happily do your entire Christmas shopping at Trade Aid, I bet – take a look at the amazing range of stuff they sell – and deliver!). Another great things about shops like Trade Aid (selling stuff from the developing world, supporting small businesses) is that they usually have labels about exactly who made the products and where. Great for kids to have clear pictures of the other people whose lives are touched by their purchases. Help littlies count the cost of the stuff you buy. Let them feel good about participating in commerce that makes the world better. The other end of the consumption chain, of course, is what we do with stuff when we’re done with it. Very small children are quite capable of learning the difference between rubbish and recycling, and which container each goes in. You can start out with that kind of sorting, for very little kids. Then move to more of those ‘why’ conversations about where things go when we throw them away. Teach them early that there’s no such thing as ‘away’, there’s just somewhere else. Take them to the recycling station and the landfill so the ‘away’ isn’t hidden. Most recycling businesses welcome public visits to see what happens behind the scenes – what a cool adventure that could be for your kids, right? Take some friends and make a day of it. Involve kids in family decisions about driving or taking public transport, taking into account the (whole) cost of fuel and emissions. Garden with them (a whole nother topic, really, so I’ll leave it there for today). Encourage them to sort through their toys and clothes, regularly, and find better homes for their things, like a women’s refuge, a charity shop, or friends with younger children. Mend things with them to give their broken stuff new life. Teach kids how to re-attach a button or sew up a hem. And all kids like superglue, don’t they? There are heaps of team volunteering opportunities for both adults and kids, where you can join with others to increase your impact. 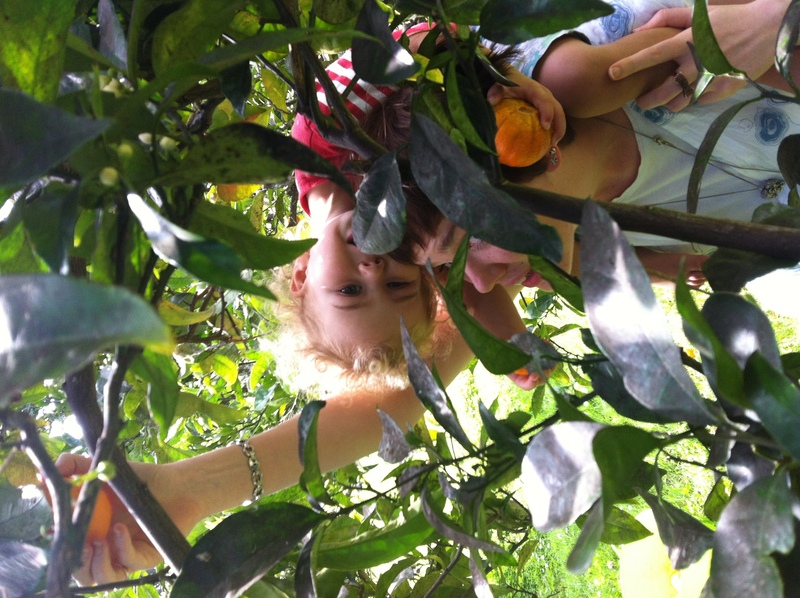 Last week the lovely Laura Giddey (you might remember that she’s written guest posts here on being single, being a wedding celebrant, and buying locally-made gifts at Christmas) was joining a team of volunteers to pick unwanted fruit with Community Fruit Harvesting. Like similar groups around the country, they pick surplus produce and give it schools and food banks, or make it into preserves and pass it on that way. How cool is that? 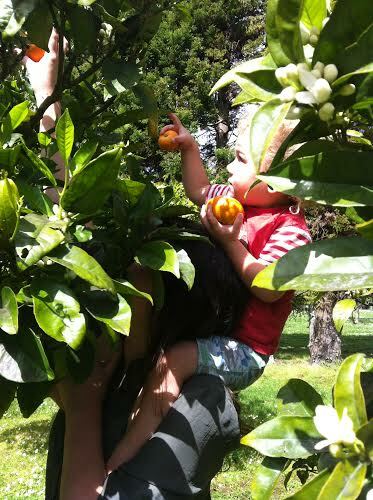 We were passing through Auckland on our way home, jet-lagged and recovering from a week of illness, so Laura very kindly took our little boy, two-and-three-quarters, with her for the afternoon of picking fruit from a retired citrus orchard. He had an absolute ball, and even brought me home two tangelos and a lemon as trophies. So why not intersperse your excursions to playgrounds and museums with team volunteering adventures? Go and pick some fruit, clean up a beach, plant some trees, deliver meals-on-wheels – any number of ‘adult’ volunteer activities can happily accommodate small helpers. 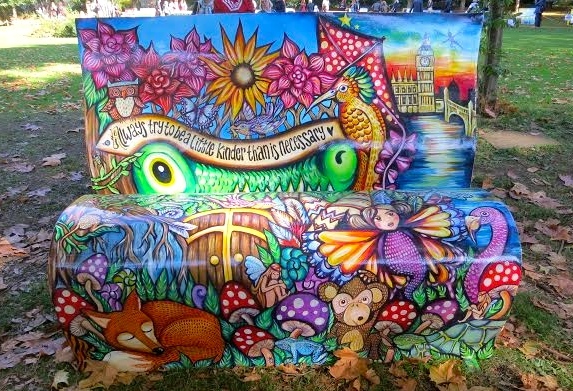 How brilliant that kids can do something real to make a difference to real people – there’s nothing token about this. Check out your local volunteer centre if you don’t know where to start. If you don’t have kids of your own, borrow some next time you’re doing something helpful like this. Make sure you talk about the point of what you’re doing (remember that as much as kids learn by observation, a lot of ‘values’ messages also need to be spelt out). It’s a fun activity that also makes the world a better place. Be specific and be proud, together. Little ones can make a direct impact in their world by making good choices in their everyday lives. But they probably can’t stop the spread of ebola or feed a hungry refugee themselves (neither can most of their parents). Luckily for all of us, we can partner with people who are doing those things, particularly by giving money to them and their projects. 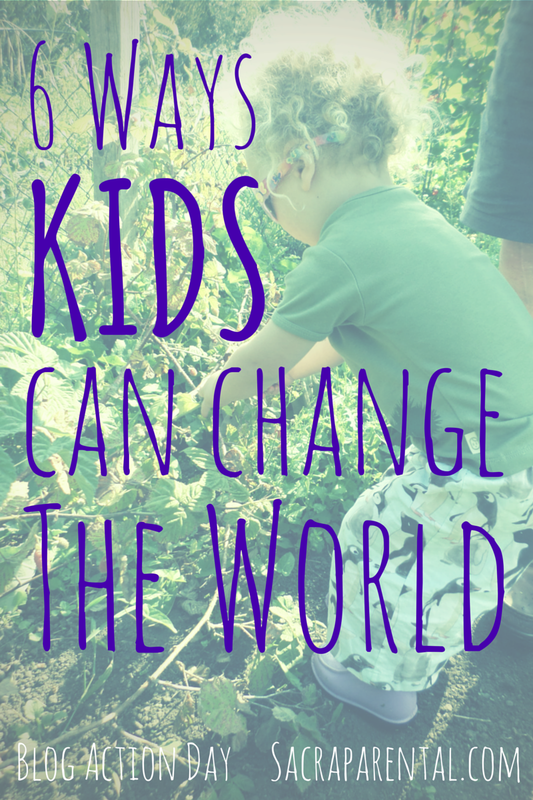 If your kids have their own disposable income, from birthday presents or a regular allowance, then they have the power to make a difference in the world at whatever rate they choose. Let’s make sure they know how powerful they are. When that happens, what a wonderful chance to take it seriously and let our kids respond in a meaningful way. Show them they have the power to contribute. Lucy at Lulastic and the Hippyshake has a great piece on all the advantages of getting kids involved in child sponsorship – it might be worth considering for kids you know. If you’re part of a church community there are probably some overseas workers you could connect with directly. Your kids could write to them, as well as join their funding team at the rate of, say, $1 a week. Financial generosity is a great habit to start early. If they don’t have money of their own, brainstorm ways they could earn money that they can donate to whatever cause has captured their compassion. I bet your neighbours would find an appeal to do some weeding or wash a car pretty irresistible if it’s so a child can respond generously to needs in the world. Making room for the stranger is an ancient cultural practice in many parts of the world. ‘Hospitality’ has been distorted, in much of the modern world, into having your friends over for dinner, but historically, including in the ancient Christian practice, it’s about welcoming the stranger who needs food and shelter and care – hence the related English words ‘hostel’ and ‘hospital’. Encourage your kids to practise this kind of hospitality. If social hosting isn’t just about friends, that might change who they choose to invite to a birthday party, or for a play date (or it might not – this is a hard one even for adults to learn, so go slowly). Maybe they can proudly open the door to guests you or they have invited or serve them food or drinks. If they’d rather help out away from the spotlight, they can make up a bed for someone you’re hosting or help with the dishes. Again, the usefulness of all this is all in how you frame it. Rather than just ‘doing a job’, your kids are showing love and welcome to someone who needs it, doing their bit to look after somebody, maybe even somebody they don’t know very well. Most children have a keen sense of justice (as you’ll find out if you serve a bunch of kids different amounts of cake, yes?). Adults around them can help to show them that injustice is something they can tackle, at any age, and itdoes make a difference. You have to put it right.